A number of studies present cross sections that include geophysical logs (gamma ray, spontaneous potential, resistivity) that can be used to derive a semiquantitative estimate of net sand thickness in the lower Potomac aquifer (Hansen, 1968; Brown and others, 1972; Cushing and others, 1973; Trapp and others, 1984). Anderson (1948) and Benson and others (1985) provided grain-size analysis results from cores that can also be used to evaluate net sand thickness in the lower Potomac aquifer. 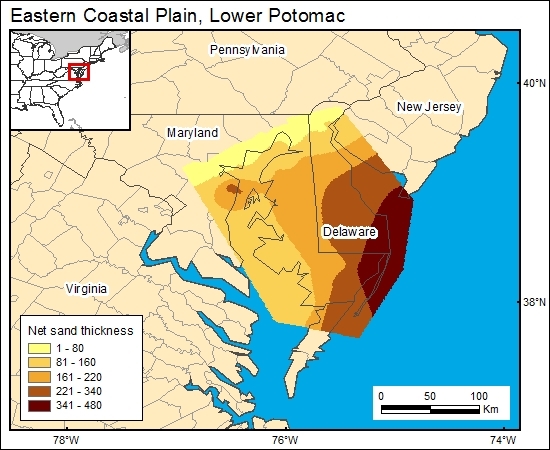 Otton and Mandle (1984) and Hansen (1984) provided information regarding areal distribution of sands within the Potomac Group, and these data were gridded and used in the GIS (c4potomacg). Anderson, J. L., 1948, Cretaceous and Tertiary subsurface geology: State of Maryland Board of Natural Resources, Bulletin 2, 456 p.
Cushing, E. M., Kantrowitz, I. H., and Taylor, K. R., 1973, Water resources of the Delmarva Peninsula: U.S. Geological Survey, Professional Paper 822, 58 p.
Hansen, H. J., 1968, Geophysical log cross-section network of the Cretaceous sediments of southern Maryland: Maryland Geological Survey Report of Investigation No. 7, 33 p.
Otton, E. G., and Mandle, R. J., 1984, Hydrogeology of the upper Chesapeake Bay area, Maryland with emphasis on aquifers in the Potomac Group: Maryland Geological Survey Report of Investigations No. 39, 62 p.